My research assistant Keren Wang (SIA MIA 2012 expected) have been doing research in the run up to the 18th Congress of the Chinese Communist Party (中国共产党第十八次全国代表大会). This is an important event--one that will set the course of both state and Party for the next decade. For background, See Malcolm Moore, China's Communist Party Congress: Q & A, The Telegraph (UK), Sept. 28, 2012; Cheng Li, Preparing for the 18th Party Congress: Procedures and Mechanisms, Hoover Institute 9-2012. This brief post suggest some important contours of the upcoming meeting that might be a useful baseline for analysis as the Congress goes forward. In later posts I will consider some issues of Chinese State Party constitutional organization in more detail. The date of 18th National Congress meeting is finally set, November 8th. So we have six weeks to go before seeing the new generation of leaders. Much will be happening during this period, but in the background. Few months ago in Beidaihe Restorts (Edward Wong and Jonathan Ansfield, China’s Communist Elders Take Backroom Intrigue Beachside, The New York Times, July 21, 2012), the current leadership along with party elders had a week-long meeting with top academics of China, one major topic they discussed was the possibility to reduce the number of politburo standing committee from 9 to 7 persons. Apparently the current 9-person model is causing the formation of factions within the executive body. Therefore, who will make to the next politburo standing committee will in someway depend on the size of the next PSC. 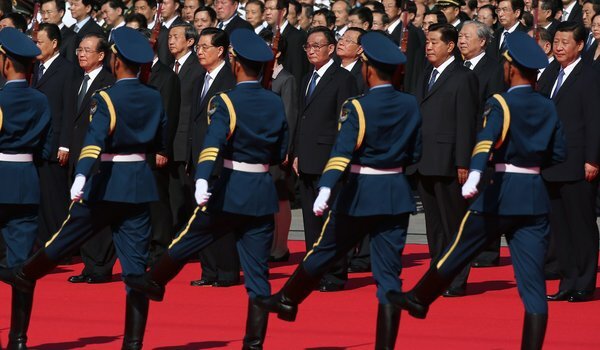 Rumor goes that both Hu and Xi are in favor of trimming down the size of the PSC "Both Mr. Hu and Mr. Xi had been among those pressing for the standing committee to be reduced in size, to strengthen central decision-making, according to several people. " Edward Wong and Jonathan Ansfield, With a Transition Near, New Questions in China, New York Times, Oct. 1, 2012. Although only six weeks away, all evidences so far suggest that the Party is still trying to figure out the exact membership of the next PSC. The chairsmatic liberal governor of Guangdong, Wang Yang is also considered a likely but controversial pick. Sui-Lee Wee and James Pomfret, Wang Yang: reformist credentials tested by Chinese system, Reuters, Sept. 234, 2012. He was the ideological counterpart of Bo Xilai. Under his rule, he relaxed restrictions on protests, initiated radical media reforms, promoted democratic reforms for local governments, and ran a marked-based neoliberal economic model. He also repeatedly called for aggressive reforms of both the Party and the government. He's a major figure to watch. The Tianjin party chief Zhang Gaoli might also become a member of the PSC, though this is still hardly certain. There's a cliche among Party Officials recently, that Ideologically speaking, the Party right now is in its most divided state since its founding. That is not a bad thing--it suggests the sort of robust party democracy that is being put forward by Xi Jinping ("Always Uphold and Fully Utilize the Unique Advantages of the Party" (始终坚持和充分发挥党的独特优势) : Xi Jinping (习近平) and the Institutionalization of Intra-Party Democracy With Chinese Characteristics in the Chinese Communist Party). But current divisions are founded on two unifying points of consensus: first, nobody believes that the so called "China Model" is a matured model, they all agree that China needs reform, though reform is to proceed along the lines of the China Model. "The congress will hold high the banner of socialism with Chinese characteristics, be guided with the Deng Xiaoping Theory and the important thoughts of "Three Represents," and thoroughly carry out the Scientific Outlook on Development, according to the meeting." CPC to convene 18th National Congress on Nov. 8, Xinhua, Sept. 28, 2012. 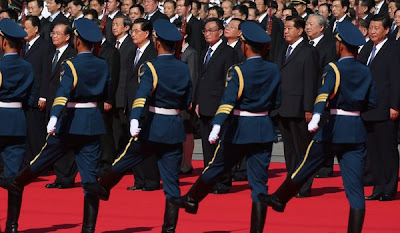 Second, no one in the highest levels of the CCP is foolish enough to advocate that China to simply adopt another country's governmental model, along the lines that are popularly called for among Western intelligentsia and some Western legislative organs. But beyond these two points of consensus, everything else is on the table. One of the most contentious issue is on legal independence. Wen Jiabao last month publicly called for a independent legal system in China, and a month later, People's Daily ran an article on its front page denouncing the idea of independent legal system. Very public display of divisions by the measure of such things in China... More to come!